Background: Multi-hazard risk assessment has long been centered on small scale needs, whereby a single community or group of communities’ exposures are assessed to determine potential mitigation strategies. While this approach has advanced the understanding of hazard interactions, it is limiting on larger scales or when significantly different hazard types are present. In order to address some of these issues, an approach is developed where multiple hazards coalesce with losses into an index representing the risk landscape. Methods: Exposures are assessed as a proportion of land-area, allowing for multiple hazards to be combined in a single calculation. Risk calculations are weighted by land-use types (built, dual-benefit, natural) in each county. This allows for a more detailed analysis of land impacts and removes some of the bias introduced by monetary losses in heavily urbanized counties. Results: The results of the quantitative analysis show a landscape where the risk to natural systems is high and the western United States is exposed to a bulk of the risk. 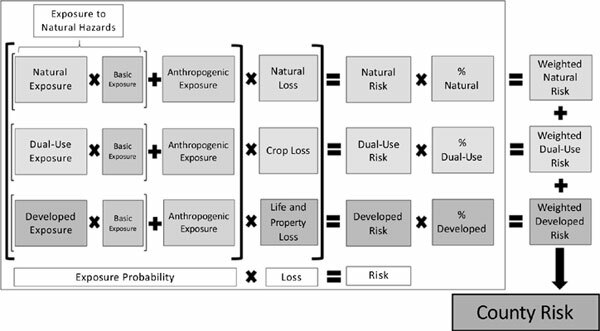 Land-use and temporal profiles exemplify a dynamic risk-scape. Conclusion: The calculation of risk is meant to inform community decisions based on the unique set of hazards in that area over time. Climate, spatial, exposures, multi-hazard, index, land-use.